Mileva Vuković je vlasnica malog preduzeća u Podgorici. Ona je otvorila malu prodavnicu kozjih proizvoda, nakon dobijanja sredstava bespovratne podrške u okviru MIDAS projekta za otvaranje farme koza. U kratkom filmu koji su napravili Vladimir Vojvodić i Ana Čabarkapa, uz podršku ostalih kolega iz Ministarstva poljoprivrede i MIDAS projekta, možete vidjeti uvod u 12 uspješnih priča korisnika MIDAS programa za grantove. Uskoro očekujemo da ovaj zanimljivi dokumentarac bude dostupan u kompletnom izdanju, sa cjelovito prikazanim pričama dijela korisnika MIDAS grantova. Zahvaljujemo se Vladimiru i Ani na pripremljenom materijalu. Recognizing the importance of integrating women into agriculture, female farmers are working to overcome traditional family roles and misperceptions about the role of women in agriculture. Thirty-seven small holder female farmers in Montenegro have benefitted from grants from the Montenegro Institutional Development and Agricultural Strengthening (MIDAS) to improve their farms. Ljiljana K., a grant recipient, sparked the idea for a workshop specifically for female farmers to network and discussion about their needs face-to-face. Female farmers account for approximately 65% of the work force on family agricultural holdings and 13% of total land holders in Montenegro. When it comes to farming in Montenegro, Ljiljana K., like many other female farmers around the country, has heard all kinds of stereotypes. These are just a few of the common refrains that echo in the ears of Ljiljana, a smallholder dairy farmer from Danilovgrad, Montenegro who has been working in agriculture for more than twenty years. Much has changed in the agriculture sector over the two decades that Ljiljana farmed and as these changes take shape, a small - but growing - group of women involved in the agriculture sector are starting to use their collective voice to demand that the Government more adequately address the specific needs and constraints faced by female farmers throughout the country. Agriculture is extremely important for rural livelihoods in Montenegro, with as much as 70% of the country’s rural population living off of the land. Agriculture land resources account for nearly 38% of the country, making rural development critical for Montenegro. 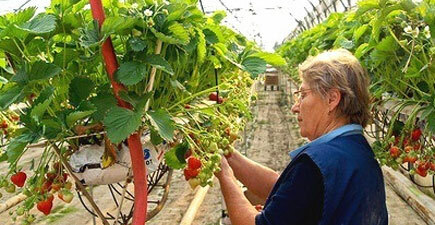 Furthermore, as female farmers account for approximately 65% of the work force on family agricultural holdings and 13% of total land holders in the country, their importance to the development of agriculture sector in Montenegro cannot be overstated. In response to a need to boost rural livelihoods through the development of agriculture sector in the country, policy makers in Montenegro have developed a strategy for this sector which promotes improvements in sustainable resource management, food safety, adequate standards of living in rural areas, and competitiveness. However, as Ljiljana and her colleagues know, any such improvements in the agricultural sector will ultimately be hampered until both women and men working in this sector given equal opportunity to to benefit from these improvements. Understanding this, Ljiljana began looking for ways to improve the situation for herself, as well as for other female farmers like her. Although successful overall in her own dairy business – producing about 750 milliliters of milk from 60 cows and calves each day – Ljiljana began looking for ways to expand her operation by first reaching out to her local extension service. The machines we were using were 40-50 years old! Ljiljana soon learned about the Montenegro Institutional Development and Agricultural Strengthening (MIDAS) Program – a $19.7 million World Bank Group project designed to improve delivery of government assistance for sustainable agriculture and rural development in Montenegro in a manner that is consistent with the European Union’s pre-accession requirements. As part of this project, Lilijana secured a grant of EUR 29,600 to implement a system to store food and improve mechanization of her business. Although Ljiljana was grateful for the opportunity to expand her small business, she nonetheless wanted more from this program. Ljiljana recognized the important role the extension agency played in providing her with information about opportunities like MIDAS and soon realized that while it is important to create such opportunities as MIDAS, it is equally important to ensure that information about these opportunities is made available – especially for female farmers, who are often excluded from trainings and other capacity building activities. Ljiljana began thinking about the situation in Montenegro and how to improve the livelihoods of female farmers by redressing many of the common misconceptions about the role of female smallholder farmers in Montenegro. Although confident that change could occur, she was also aware of the challenges faced by many women who did not enjoy the same support from their husbands and families that she fortunately did. Based on these discussions, Ljiljana initiated the idea to hold a workshop for female farmers, which was subsequently organized by the Ministry of Agriculture and Rural Development in Montengro. On June 15-16, the Ministry of Agriculture and Rural Development invited Ljiljana and13 other female farmers to a workshop dedicated to exploring ways to help female farmers strengthen their voice in agriculture by expanding networks, increasing opportunities, and raising awareness of their needs. In addition to these farmers, participants also included extension agents, the Ministry of Human and Minority Rights, and the United Nation Development Programme (UNDP) Montenegro. The World Bank and the European Commission also financed the participation of two international gender and agricultural experts. The ideas and creative suggestions resulting from this meeting between the Ministry and the female farmers can now start to take root, helping agricultural services in Montenegro better serve all farmers in the country – women and men alike. By meeting and networking, these different participants in agriculture can now work together to begin creating more space within the agriculture sector for female smallholder farmers – thus showing that by promoting ideas and speaking up for a group whose particular interests are often overlooked, the lone voice a smallholder female farmer is sometimes all that is needed to set off an agenda for change. Dragana Varezic in the Montenegro Country Office and Milos Sturanovic, MIDAS Project Manager, Ministry of Agriculture and Rural Development offer this story. Like Vucko Pesic's family, 70 percent of Montenegro's rural people live off the land. Most own small farms, and though the country has plenty of water and land, and a good growing climate, money to invest, improve, and raise agricultural production is scarce. Vucko Pesic was born in the town of Bijelo Polje in the rural and agricultural north of Montenegro. In 2002, he and his wife decided to move to the family property in the village of Tomasevo, not far from Bijelo Polje. The property had been virtually abandoned. "I decided to move to the village as I saw that as the only way to support my family; living in town and working as a low paid laborer did not bring sufficient money to support my wife, and my three children. So, I decided to turn to agriculture and take advantage of the family property," says Pesic. He began his life as a farmer with three cows, about ten sheep and 100 beehives, which he inherited from his father. For several years, the family ate everything it grew, made and raised. And they struggled with farm life, until Pesic's mother taught her daughter-in-law how to make cheese, using a special family recipe passed down for generations. Then, in 2007, Pesic managed to market the cheese to a local restaurant. The restaurant, Durmitor, is famous for its good homemade food. After that breakthrough, the cheese began to sell itself. More and more people heard of it, bought it and ate it. The phone began ringing and orders poured in. Demand outstripped supply. The family wanted to buy more livestock and more equipment for cheese making, but they had a hard time raising the money. Pesic turned to a program in Montenegro that offers small grants to small farmers supported by the World Bank. Farmers have to contribute 50 percent of the investment, and they must present a business plan that outlines sustainable growth and increased production. Competition is fierce. Pesic is delighted that he qualified for the grant, "I now have 16 cows and 5 calves, and this will help me create a good starting point for my children when they grow up and find their own way." He says he is still paying back some loans but, "with expanding the capacities, which will bring more income, I am sure to improve overall conditions on the farm and my household, I am building a future for my children." The grant program offered them almost 9,500 euros and the Pesics kicked in the rest, for a total of almost 19,000 euros in basic improvement and upgrades. With the money, the Pesics invested in crucial equipment and 5 more cows for milk for their cheese. All family members help with the farm chores. Vucko is responsible for the livestock, while his wife Milijanka runs cheese production. The couple's six children help clean the stables and feed and milk the cows. The new equipment, new cows and expanded work are boosting Pesics' income by over 1,500 euros a month. They are increasing their cheese production by ten kilos a day. The Pesic family is not alone. Montenegro is working to improve food safety standards, upgrade facilities, and modernize agriculture. Officials hope this focus on farming will raise living standards and export earnings while also speeding integration with the European Union. The small grants program aims to modernize food safety and production while also managing farming within the country's broader environmental landscape. As for the Pesics, they are happy to be a small part of big changes to agriculture in Montenegro. They've gone from poor laborers in town to successful farmers running their own company. Driven by demand, a delicious product, and a grant that let them expand when they needed it most, they represent a new kind of business-oriented farmer in Montenegro's rural north.